The Fin Whale is found in oceans all over the world, from the tropics to the polar areas. They are known as a pelagic species, often occuring in shallow waters close to the shore. Even though they are found in oceans across the world, they are not as common in tropical waters or ice laden seas. They are around 19 to 20 metres in length, and can weigh as much as an estimated 70 tonnes. Fin Whales found in the southern hemisphere have been reported up to 26 metres in length. They have a white underbelly, and are a brown-grey colour on top. They are migratory whales, and have been observed in groups of up to 300 whales. They normally however travel in a pod with 6 or 7 other whales. 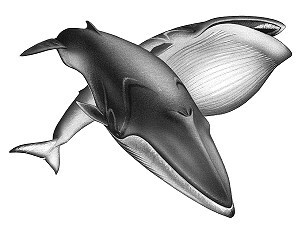 They have a narrow flat V-shaped head and two blowholes. They are known by a number of other names such as the Finn, the Finner, the Finback, the Common Rorqual or the Herring Whale. The Fin Whale is currently (2003) listed as an endangered species. Did you know? The Fin Whale is one of the fastest whales with the ability to swim and sustain a 37 km/h speed through the water. From this feat, it is often referred to as “the greyhound of the deep”. The Fin Whale also has the ability to leap completely out of the water. On the other extreme, they can reach depths of over 250 metres. They have been known to consume one to one and a half tonne of food per day. They feed on a variety of aquatic species including squid, herring and capelin. E-mail to add your Fin Whale related website.